This is the DOWNLOADABLE edition of the book- The entire book is included! Ages 7 through 14. 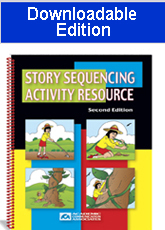 This book includes worksheet activities designed to strengthen storytelling and sequencing skills in the following areas. (1) Telling stories in sequence; (2) Identifying errors in a sequence of events; (3) Finishing incomplete stories; (4) Using information to create stories. Between 4 and 8 pictures are used to show the action in each of the sequencing stories. Sequencing Stories - Level 1. Each story in this section includes between four and six pictures that illustrate the critical story events. Comprehension questions follow each story. The story pictures can be cut out for use as sequencing cards. Students then sequence the pictures and retell each story. Sequencing Stories - Level 2. The stories in this section are more complex and contain more information than those in the previous section. Each story is accompanied by either six pictures or eight pictures. After listening to each story, students sequence the pictures and retell the story. Add to the Story. In this section, students are asked to expand stories by adding details to stories presented orally. Construct a Story. The activities in this section require students to create original stories when presented with story starters and other story information. All of the story pictures and worksheets may be reproduced. The updated downloadable digital edition includes the COMPLETE BOOK and makes it easy to print out copies of the reproducible book pages.